We are currently closed for the season. See you in September & October! Come enjoy corn mazes, hayrides & over 45 other farm activities in a beautiful country setting! Submit them to win tickets, season passes & gift cards! At Ramseyer Farms, we believe in the importance of spending quality time with family and friends. Using the resources God has given us, we strive to make our working farm a place where guests of all ages can enjoy fun and interactive farm activities, while creating lasting memories together. Over 275 signs highlight what makes Ohio great! 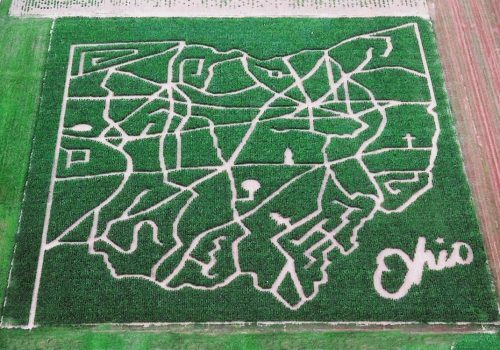 Walk through this giant map of Ohio and learn about famous Ohioans, changes in transportation, the Underground Railroad, natural resources, and much more. O-H-I-O! Enjoy a 20 minute hayride through part of the farm’s 700 acres of scenic fields and woodlands. Fall brings autumn leaves, bonfires – and pumpkins! If you’re searching for the perfect Jack-O-Lantern, a quality specimen for pie or roasted seeds, or orange beauties for your home and yard decoration, Ramseyer Farms is the place to find them.